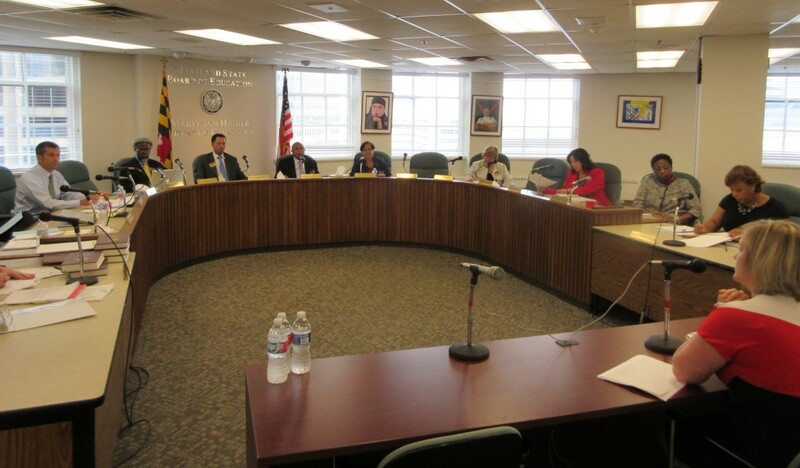 Maryland’s State Board of Education on Tuesday confirmed plans to release PARCC assessment scores in late October and early December. The PARCC, which stands for the Partnership for Assessment of Readiness for College and Careers, was administered for the first time CORRECTION in 11 states and the District of Columbia in the spring as a part of the Common Core Standards Initiative, a widespread but controversial effort to measure education in the United States. Teachers in Maryland proctored the new statewide exam at all but seven schools, according to a Maryland Department of Education staff report. The board plans to release and discuss the statewide scores at their next two monthly meetings, with high school results on the agenda for Oct. 27, and discussion of elementary and middle school results planned for Dec. 8. High school students are scheduled to receive paper take-home reports on Nov. 3, while elementary and middle school students are expected to receive their scores on Nov. 30, according to board documents. Board members said the release was delayed this year because several public schools in Maryland did not administer the exams on computers, and because it is the inaugural testing phase. According to a report presented to the board, around 18.4 percent of Maryland students took the test on paper. This equates to around 172,000 tests that would not have been represented in statewide scores if the board had chosen to release scores without these results. Scores in subsequent years are expected to be released in the summer. Many of the paper exams came from Harford County, whose school administrators chose to forgo computers, according to the report. In the final phase of implementing the new assessment, board members also discussed the change in performance level settings – sometimes called “cut scores” – and their concerns about explaining scores to parents. Level 5 and Level 4 scores, the top two tiers, mean the student met or exceeded expectations, and indicates college and career readiness, or grade-level proficiency. Previously, the state board held Level 3 to the same passing standard. However, following recommendations at meetings in the past month, the national PARCC Governing Board and Advisory Committee on College Readiness determined Level 3 should mean that the student approached score expectations, but did not meet them. Board members said they expect the PARCC exam’s statewide scores to be lower than other standardized test scores in previous years. After adopting the Common Core State Standards and associated assessments, states began releasing preliminary results last week from the first round of tests. In Illinoies, fewer than 40 percent of students met or exceeded score expectations, according to that state’s Board of Education.